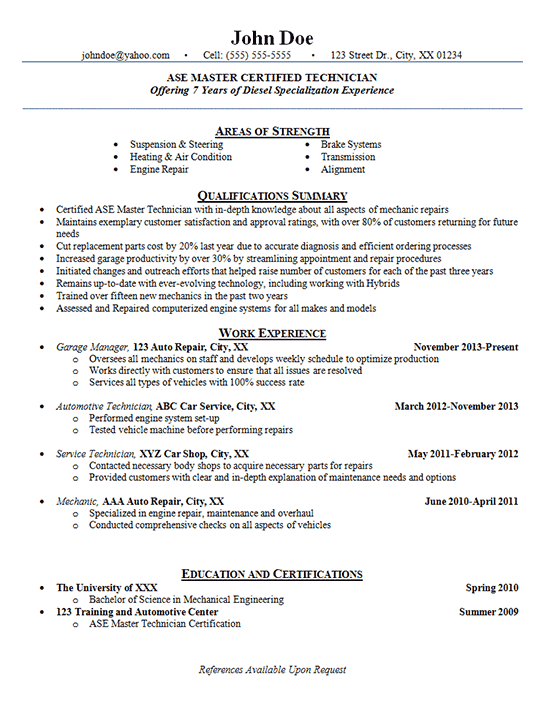 This resume was created for a career-long mechanic hoping to move up in the field. The automotive technician resume displays a lot of experience that highlighted by stating that he was a Certified Technician with over 7 years of experience. From there, the document emphasizes strengths by including an Areas of Strengths section and a Qualifications Summary. This job seeker did have experience in a variety of body shops, but he also bounced around quite a bit. In order to de-emphasize job hopping, the writer accentuated their impressive skills and qualities that he brings to the table. This was accomplished by including the majority of information in the previously mentioned summary sections. The goal was to grab the reader’s attention and hook them on the candidate’s impressive skill set. Education and certifications were listed at the bottom of the resume because this professional had enough real-world experience that was more recent, relevant and important to employers. Certified ASE Master Technician with in-depth knowledge about all aspects of mechanic repairs. Maintains exemplary customer satisfaction and approval ratings, with over 80% of customers returning for future needs. Cut replacement parts cost by 20% last year due to accurate diagnosis and efficient ordering processes. Increased garage productivity by over 30% by streamlining appointment and repair procedures. Initiated changes and outreach efforts that helped raise number of customers for each of the past three years. Remains up-to-date with ever-evolving technology, including working with Hybrids. Trained over fifteen new mechanics in the past two years. Assessed and Repaired computerized engine systems for all makes and models. Oversees all mechanics on staff and develops weekly schedule to optimize production. Works directly with customers to ensure that all issues are resolved. Services all types of vehicles with 100% success rate. Tested vehicle machine before performing repairs. Contacted necessary body shops to acquire necessary parts for repairs. Provided customers with clear and in-depth explanation of maintenance needs and options. Specialized in engine repair, maintenance and overhaul. Conducted comprehensive checks on all aspects of vehicles.